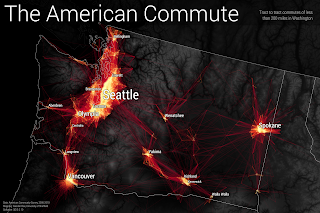 Following on from an earlier blog post about mapping commuting patterns in the United States, I've been experimenting again. I finally got round to looking at more of the comments on the Reddit thread on the map and I spotted one about topography, so I wanted to go back and add in a topographic layer to the map to see if it added any additional explanatory value. It's a difficult balance trying to show so much, but I thought it was interesting so I'm sharing it now. The underlying topographic data are from NASA's Visible Earth catalogue, and I've used a dark one below, as you can see. First of all, here's the large updated map and following that a little commentary. 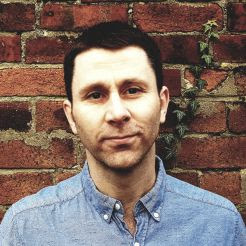 I've also added some different extracts at the bottom of the post, including a blue version. Just a map of where people live? Not quite. Huge version. I've got a bit of work to do on this as quite a few things need to be fixed (labels, colours, transparency, etc) but I think the addition of the topographic base layer is quite useful. 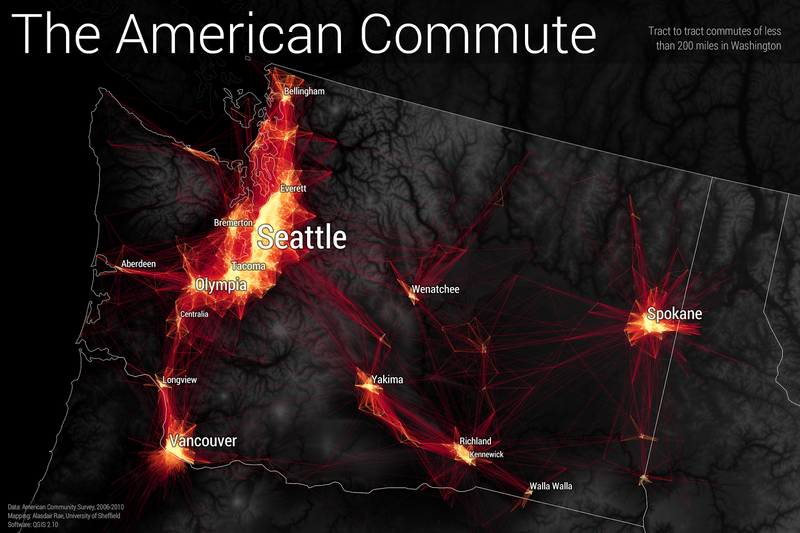 Well, it's useful in parts, particularly in the western United States where the density of lines is much lower. Some examples below to illustrate this, starting with California's Central Valley. 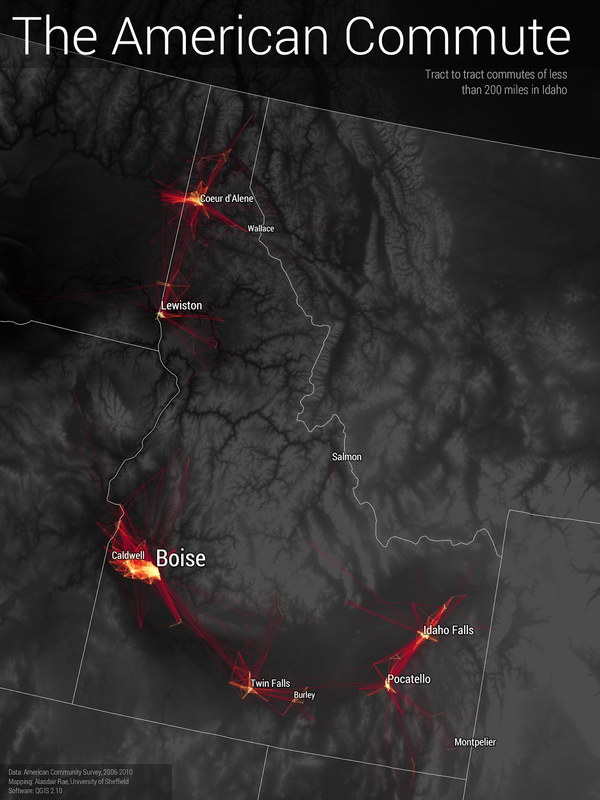 From Redding in the north to Bakersfield in the south, it's clear that the Central Valley acts as something of a container for commuting. Obvious if you live there perhaps, but I like the way that this comes through from the topographic base layer. 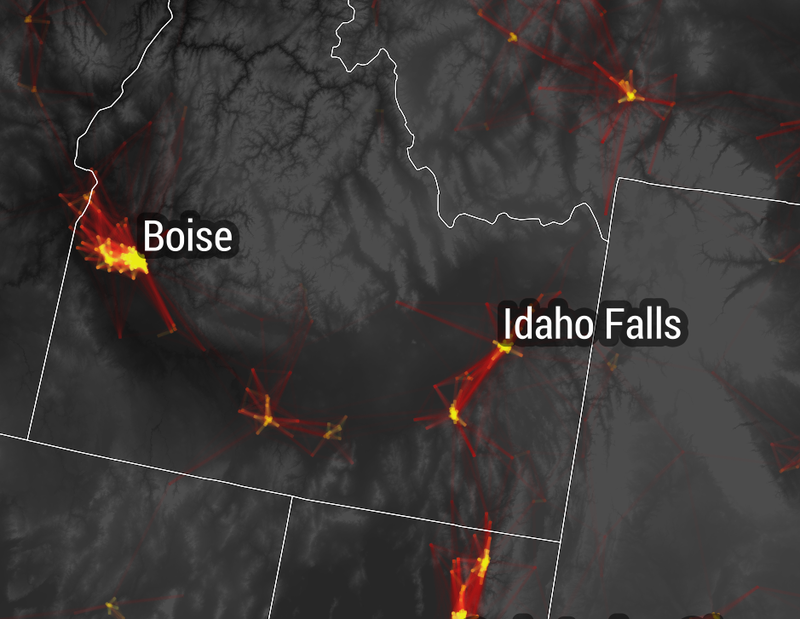 A similar kind of example, though less obvious, from Idaho is shown below, stretching from Boise to Idaho Falls in the east of the state. 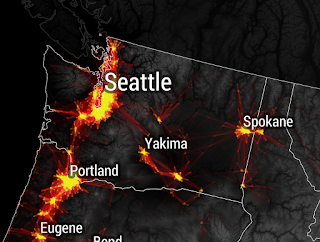 The impact of the North Cascades as a barrier between the west of Washington and the east of the state is clear when you look at commutes, but it's more obvious why this is the case when you add the base layer as I've done below. Talking of mountains, I thought I'd also add in an example from the much more densely populated east of the US. 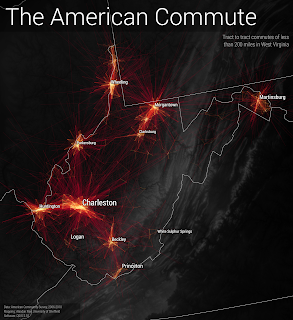 Here you can see the impact of the Appalachians on commutes, at least in part. Well, what you can see is that there is a big gap in the map, and not too much more. 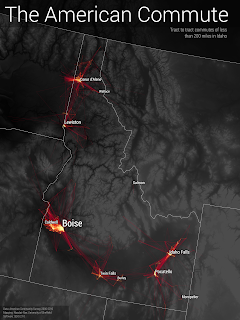 But, if you look closely, you can see the way some connections follow a linear path where we might expect a more hub-and-spoke pattern if the land were flatter. 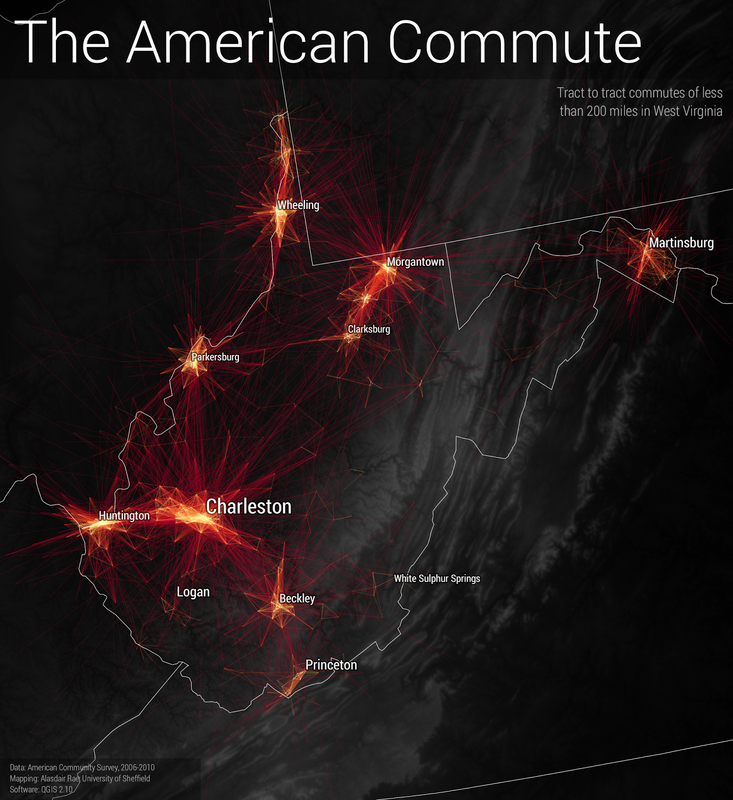 Nobody's going to commute across the mountains, are they? 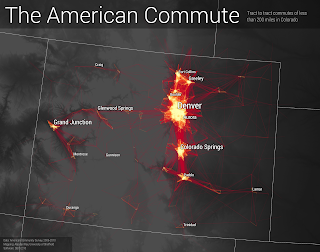 I wanted to zoom in to a few different areas to take a closer look at the relationship between commuting flows and topography, so first of all I chose Colorado and Idaho as they are very interesting in that regard. Two more maps of individual states below. 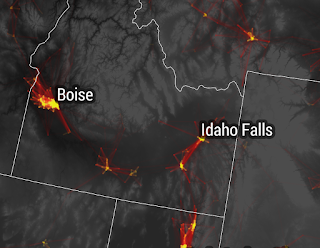 As in the case of the above, I've restricted it to flows of 200 miles or less (just to make sure that the most extreme commutes are accounted for) and I've shown all flows that end up in a state, so you should see some cross-state-boundary flows on the maps. First of all, you can see more clearly the east-west split in Washington and the extent to which Spokane serves as a kind of regional commuter hub. Then I've done another map, this time for West Virginia, just because it's one of the most interesting ones in a very crowded eastern United States. That's all for now. I may add more states in future.